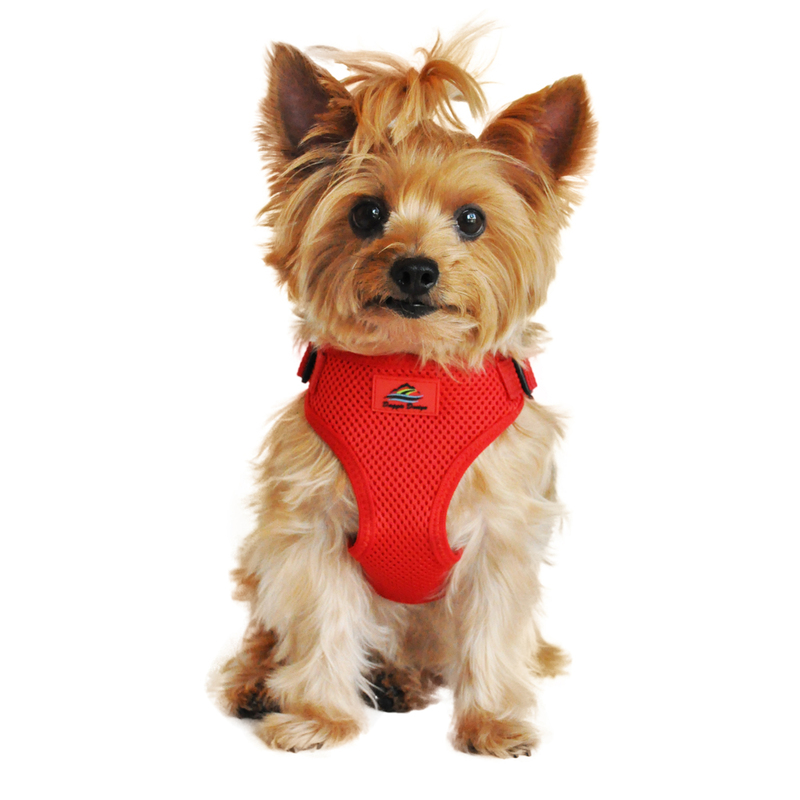 Dogs will step into a size that fits with the Wrap and Snap Choke Free Dog Harness in Flame Red! Be ready for anything with this easy-to-use Wrap and Snap Choke-Free Dog Harness in Flame Red! The Wrap and Snap Harnesses by Doggie Design are easy to use, lightweight, soft and feature dynamic colors and prints. 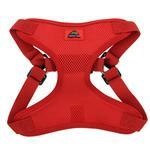 You'll especially love the classic look of this flame-red harness. It's a ready-to-wear style that is comfortable and durable. It's a great choice for Christmas, Valentine's Day and any patriotic event. 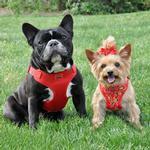 Wrap and Snap Choke Free Dog Harness by Doggie Design - Flame Red Customer Photos - Send us your photo! Hi, my name is Chico, I just love my red harness! When ever I wear it, I just love to strut! Posted On 11/25/18 by Grapevine from Grapevine, AR Yes, Grapevine recommends this product! I searched everywhere for a step in harness for my Chico. This one exceeded my expectations. As soon as they come available, I will order another one. This item does well for my Chorkie that likes to pull. He is not choking himself, as he had with other harness. It runs small, my 8 pound dog, needed a medium size. Posted On 11/08/18 by Pamela O from , Yes, Pamela O recommends this product! We tried at least 3-4 different harnesses for my 4 pound little one and everything was too big or she would find a way to get out of it, this harness worked perfectly! I Can always count on baxterboo to have great products!! Posted On 05/24/18 by Lauretta B from Bella Vista , AR Yes, Lauretta B recommends this product! While the pic shows this to be choking the dog. It says it doesn’t choke dog! It’s perfect in fit, XS, 5lb yorkie. Red looks great on her. Easy on/off and secure! Doesn’t choke your dog! Posted On 04/12/18 by Karen T from Traverse City, MI Yes, Karen T recommends this product! The harness is really choke free, and I have purchased two from Baxter Boo. 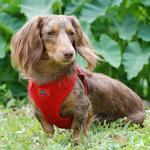 I also like that the harness can be adjusted in four places, and is easy to put on my dog. Posted On 11/17/17 by Richard T from Vista, CA Yes, Richard T recommends this product! the easiest to put on I have ever owned. Took about 30 seconds to adjust and we were ready to go. Posted On 08/23/17 by Billie Jones from Hemphill , TX Yes, Billie Jones recommends this product! This is a great harness and it fits perfect. It's made of high quality material. Posted On 08/08/17 by jerrie y from , Yes, jerrie y recommends this product! Posted On 07/08/17 by Marylynn B from , NJ Yes, Marylynn B recommends this product! It's very easy to use and fits great on my 7 pound Maltese dog. Posted On 05/16/17 by Pamela H from Ontario, CA Yes, Pamela H recommends this product! I love this Wrap and Snap harness. The quality is excellent and I love that it is so adjustable. A perfect harness for my little Min Pin Sascha. Too easy to get out of. I bought a Wrap & Snap Choke Free Dog Harness and sent it to my friend in Thailand. It looks like a wonderful harness but apparently, all the dog needs to do is back out of the harness and she's free! Does anyone else have this problem? It's hard to recommend a harness when it doesn't do it's job. Posted On 03/10/17 by Bonnie B. from Dallas, TX Yes, Bonnie B. recommends this product! I'm not sure who loves this awesome harness more, my fur-baby or me! It fits perfectly; and I can tell, she is more comfortable wearing this mesh harness than the standard harness she had previously. Also, it is easy to put on and take off. Posted On 01/25/17 by Joanne T from Jensen Beach, FL Yes, Joanne T recommends this product! 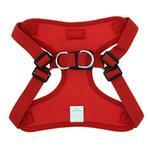 These harnesses are comfortable and choke free. It keeps my little pup safe on walks and doesn't irritate her neck or make her cough. Great for small dogs. My 9 pound maltipoo wears a size small in this style. This can be worn over clothes or under styles that have a harness hole. Posted On 06/01/16 by Sheila Hodge from Knoxville, TN Yes, Sheila Hodge recommends this product! Posted On 05/19/16 by Vindy from South San Francisco, CA Yes, Vindy recommends this product! My dog was recently diagnosed with glaucoma in her right eye. I read information online that suggested that I stop using a collar on her and use a harness because if she were to pull while on the collar, it would cause more strain to her neck, head & eyes. I purchased this harness and it works perfectly. It's very easy to put on and it fits her like a glove. My dog is about 25 lbs and this harness works very well for her needs. Posted On 03/11/16 by Megan L from Colorado Springs, CO Yes, Megan L recommends this product! 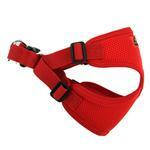 I ordered the Wrap and Snap Choke Free Dog Harness- Flame Red for our dog. He's a 4.5 lb toy poodle with 2 legs. He's missing his front right paw and rear left leg below the knee due to horrific circumstances before his rescue. I needed a harness that was step-in because I didn't want anything going over his head (his ears are so big!) or buckles on his neck, and had a hard time finding a tiny step-in harness with mesh underneath to offer balance support. We spent a couple days getting used to it, and today it served its purpose. He may be an 11 year old dog with 2 legs, but Bobb has made remarkable recovery and his professional rehab team approved him to take agility classes, with reasonable limitations for safety and physical concerns. This harness is allowing me to provide the support and safety needed to let him continue learning obstacles in a very safe and controlled way as I can offer physical and balance through the harness. Plus, he looks great in red! 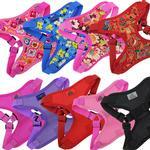 I love BaxterBoo they have the best prices and great quality! !